Windows 10 has been achieving quite a few milestones when it comes to enterprise growth. Microsoft’s latest operating system has received the seal of approval from the Department of Defense multiple times since it has been released. It appears that the strategy has worked for the Redmond tech giant as Windows 10 experienced significant growth rate this past year. Compared to its adoption rate of 27 percent last year, Windows 10 now has 48 percent market share in enterprise environments. Data collected from over 11 million enterprise users gathered by Duo Security [PDF], a cyber-security firm, reveals that Windows 7 has been slowly phased out. The most popular Windows version saw its enterprise market share decreasing from 65 percent last year to 44 percent this year. Along with healthcare, transportation & storage and insurance industries were also the slowest to adopt Windows 10. While on the other end of the spectrum, along with computer and electronics, wholesale & distribution and non-profit industries were the quickest to adopt Windows 10. Duo’s report also suggests that more users are adopting Apple devices in the enterprise segment with a slight drop in Windows users. “With more users authenticating into enterprise applications via mobile Apple devices, this shows a trend in the increasingly mobile enterprise user, accessing work applications remotely,” the report said. While this doesn’t mean if businesses are moving to Apple’s desktop offerings instead of Windows, Microsoft’s lack of a mobile solution has certainly started to show up in numbers as the enterprise user is also going mobile, accessing work applications remotely. 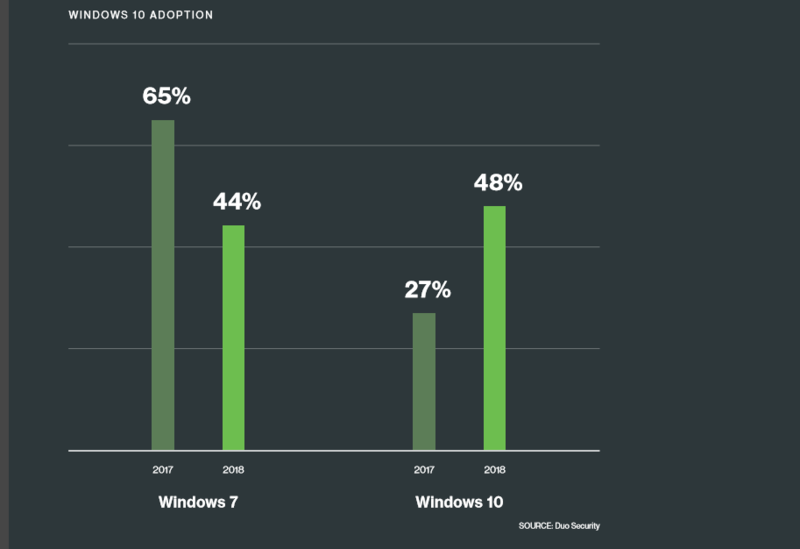 In overall OS adoption rate, Windows has gone down from 68% in 2017 to 65% this year. 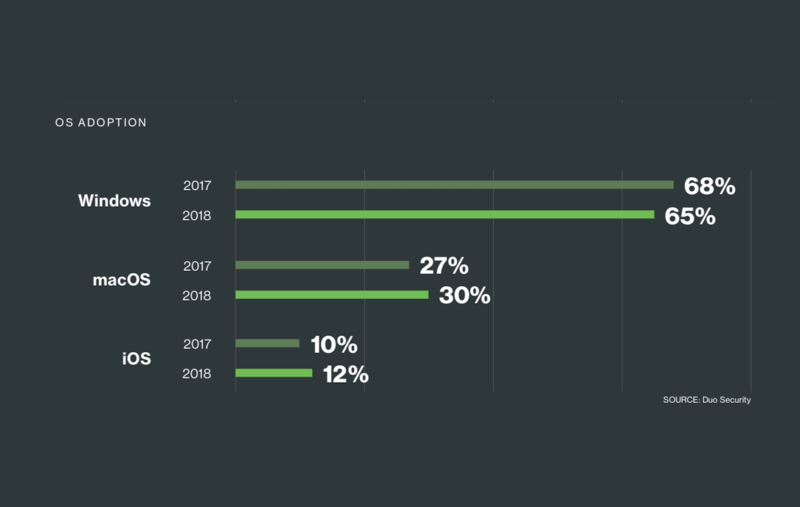 On the other hand, macOS has increased from 27% last year to 30% in 2018. iOS has also managed to see improvement in its enterprise market share.